The Transformers is an American media franchise based on a series of rebranded Japanese toys (Microman and Diaclone). The series is produced by the American toy company, Hasbro, and centered around two factions of alien robot warriors who’s deadly war eventually reaches the planet Earth. Our write-ups specifically cover the first 50 issues of the “Generation 1” comics series, which was produced by Marvel Comics between 1984 and 1993. 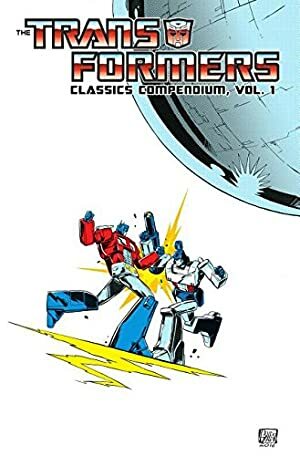 In this version, the Transformers found themselves marooned on Earth in the Marvel Universe. The series had brief cameos from Spider-Man, G.I. Joe and even visited the Savage Land. Unlike his portrayal in the G1 cartoon, this version of Shockwave is a merciless traitor who takes seizes command of the Decepticons at the first opportunity he had. Base of Operations: Mobile ; Oregon, The United States of America. Height: Approx 20′ Weight: Several tons. Among the Decepticons, Shockwave’s physical power is exceeded only to Megatron. He can lift weights in the “Class 50” range, is virtually invulnerable and is immune to all forms of human frailties (i.e. aging, sickness, disease, hunger, fatigue, etc.). As a Cybertronian, Shockwave is extremely hard to kill. Even if he was smashed to pieces, it would be possible to revive him after his artificial body was repaired. 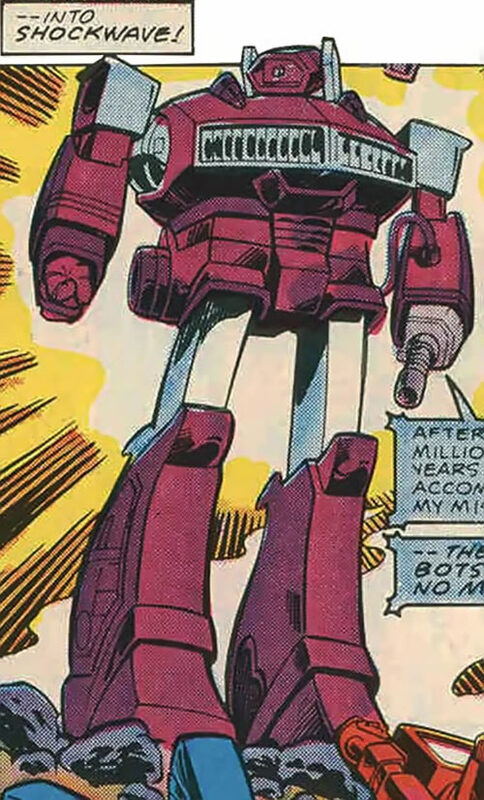 Unlike the other stranded Transformers, Shockwave’s body was never reconfigured for an “earth-mode”. As such he still retains the ability to reconfigure his body into its original secondary form, a 35 foot long ray-gun. Shockwave’s ray-gun mode is extremely powerful. His cannon emits beams of energy potent enough to destroy oil rigs and wound Transformers as powerful as Megatron. Additionally, he can emit bursts of blinding light from his cannon. Shockwave is one of the few Transformers that can fly in his robot mode. He does so via the powerful jet thrusters contained in his feet. Shockwave doesn’t bother with handheld weaponry, as the laser cannon built into his left arm is a potent enough weapon for him to rely on. 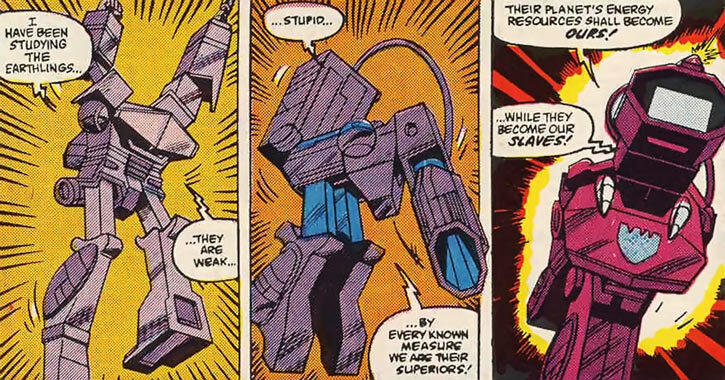 Outside of his pure physical power, Shockwave is a brilliant strategist. 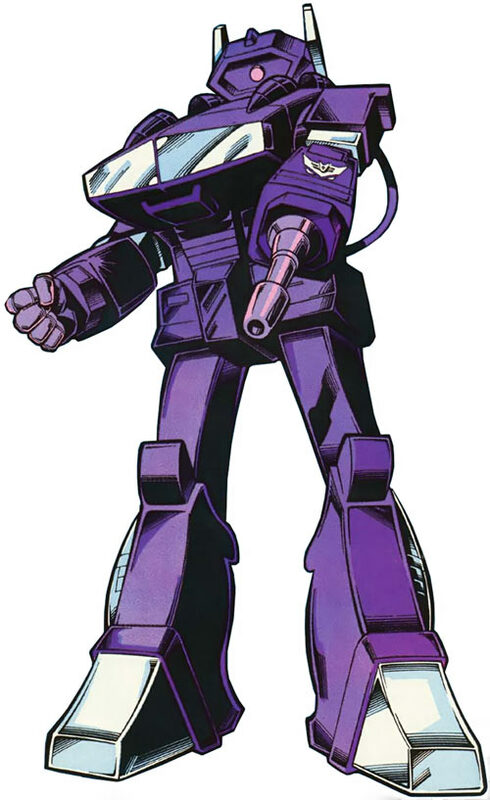 Shockwave was one the first Cybertronians recruited by Megatron in the early days of the Transformers’ war. His cold, logical mind made him a valuable counterpart to Megatron’s impulsive nature. The two built the Decepticons into a mighty army that threatened to conquer Cybertron. It was only Optimus Prime’s rise to power that prevented all of Cybertron from falling under the Decepticons’ control. Upon learning the Autobots planned to destroy an asteroid field that threatened Cybertron, Megatron decided to ambush them in the darkness of space. 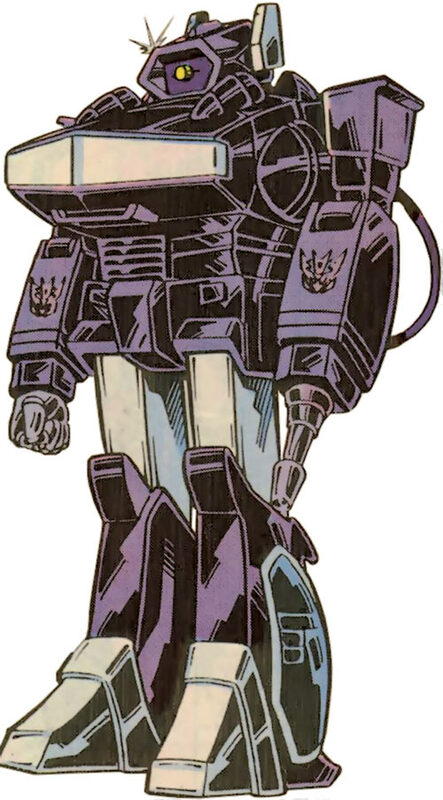 Shockwave took Megatron’s vision and designed the ambush. In accordance with his plan, the Decepticons held back until the Autobots had expended their strength destroying the belt and then attacked them full force. Shockwave remained behind in case the Autobots managed to repel the Decepticons’ attack. Unfortunately, Shockwave underestimated Optimus Prime’s resolve. In order to avoid utter defeat, Optimus crashed the Ark and all aboard into a nearby planet … the Earth. Shockwave attempted to follow the downed craft through the Earth’s atmosphere. But, the radiation belt that surrounded the planet interfered with his guidance systems and caused his to miss his target by a large margin. He landed over half a world away, in the Savage Land . 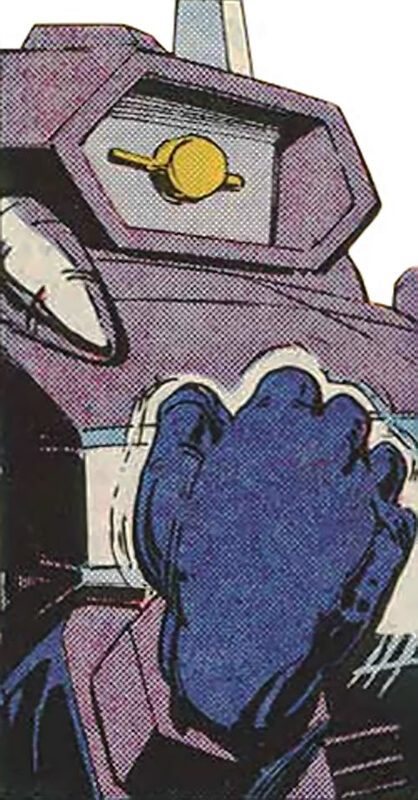 Shockwave wandered about the Savage Land in confusion for days. By the time he had regained his bearings, he was attacked by the Dinobots. While the Dinobots proved to be too weak to destroy Shockwave, they were able to drop a mountaintop down upon themselves and Shockwave. The avalanche drove the robots into a tarpit, which held them fast for millions of years. When the Autobots woke in 1984, they found the Dinobots missing. An examination of the Arks records revealed the location where they were sent. Seeking answers, the Autobots sent a probe to investigate their whereabouts. The probe found the battle-site and began excavating the area. The process awoke Shockwave from his slumber. He flew to the Ark where he ambushed the Autobots and rendered them inoperable. With no one left to oppose him, Shockwave assumed control of the Ark. He used its repair bays to repair the inert Decepticons, leaving Megatron for last. As Megatron healed, Shockwave explained his intention to take command of the Decepticons. 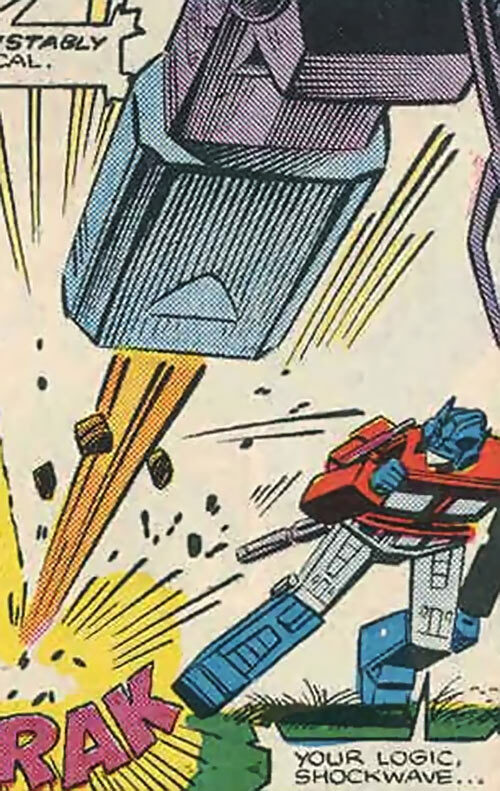 He then revealed that Optimus Prime was in possession of the Creation Matrix. The Matrix was a computer program that allowed its owner to create artificial life. Shockwave planned to take the Matrix from Optimus to make thousands of new warriors. Megatron feigned compliance until he had healed enough to attack Shockwave. The moment he had, Megatron attacked Shockwave with his full fury. Megatron battered Shockwave in the opening seconds of their battle. But Shockwave weathered the vicious assault, and in moments regained the upper hand. Seconds later, Shockwave brought Megatron to the edge of death once more. It was only then that he let up, and allowed Megatron to surrender. With his victory, Shockwave cemented his control over the Decepticons. Shockwave spent the next few days enacting his plan. He fought the American military on his own and seized a nearby aerospace plant. He then sent his Decepticons to gather the required supplies they would need to build his army. While he was absent, Megatron lost control of the Ark to Ratchet and the returned Dinobots. Shockwave cared little; he had defeated the Autobots in the past and felt he could do so again. Instead, Shockwave started the process of creating his army. Days later, Shockwave had completed the construction of one hundred warriors. He named the first warrior Jetfire, and attempted to bring it to life with Optimus’ Matrix. To his shock, the process failed again and again. In time, Shockwave deduced that Optimus must have given the Matrix to one of his subordinates. He soon discovered that Optimus had hidden the Matrix in the mind of Buster Witwicky. Shockwave sent Jetfire to retrieve Buster from his home. A short while later, the automaton returned with Buster in captivity. The Autobots followed close behind him. While they prepared to attack, Shockwave sent Jetfire to meet them with a replica of Optimus’ head. The Autobots delayed their attack when they thought Shockwave had returned Optimus. They attached the false head to Optimus’ body (which they had brought with them). Even as the Autobots celebrated the return of their leader, the fake attacked. As the Autobots fell before the fake’s attack, the Decepticons attacked from behind. While the battle raged, Shockwave prepared to rip the Matrix from Buster’s body. Buster had other plans. As soon as he awoke, he used the Matrix to seize control of Jetfire and forced it to assault Shockwave. The attack stunned Shockwave for a few long seconds. During that time, Buster commanded Jetfire to free Optimus Prime. The Automaton then took Optimus’ to the battle where he regained his body. By the time Shockwave recovered, Optimus had decimated the Decepticon forces. This act finally enraged the logical Decepticon. He launched himself skyward and attacked his former prisoner with his full strength. He needn’t have bothered. 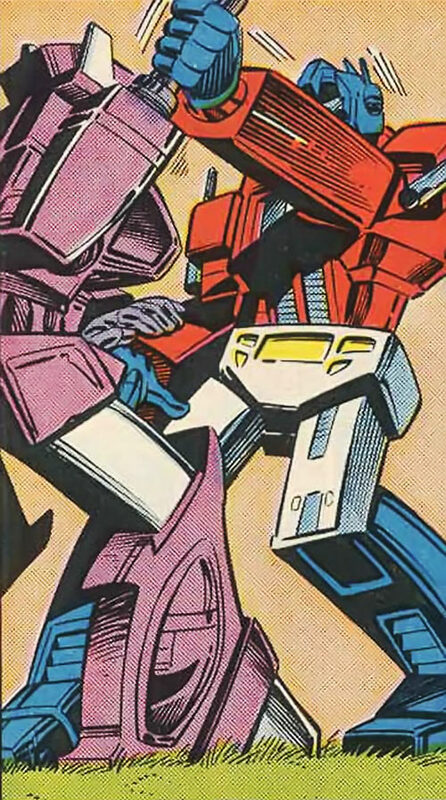 The two struggled for only a few moments, before Optimus overpowered Shockwave. In his fury, Optimus tossed Shockwave into a massive sinkhole. In moments, Shockwave sank into the earth and disappeared once more. Shockwave is a stocky and bulky semi-humanoid robot. He stands somewhere over 20 feet tall, has a thick barrel-like chest and long powerful legs. The dominant colour on the armoured plating that covers the majority of his body (head, chest, arms and lower legs) is a deep shade of purple, while the remainder of his body is stark white. 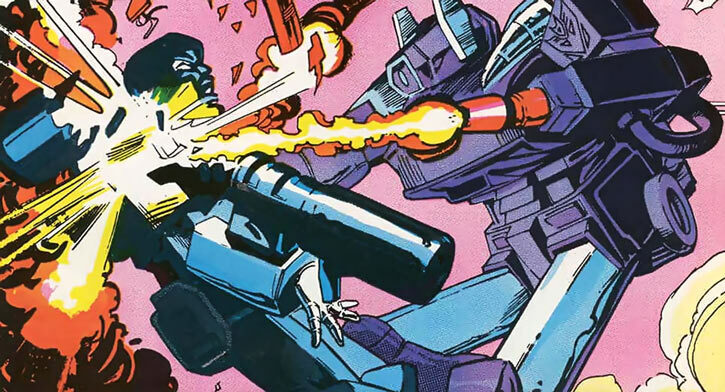 In the place of a left hand, Shockwave has a long barreled laser cannon which is connected to the power source on his back via a long cable that is attached directly into the back of his forearm. 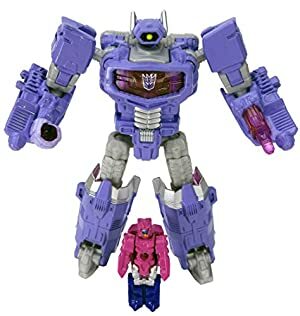 Shockwave’s head resembles a large purple helmet. He has a single yellow cyclopean eye directly in the center of his face; no other humanoid features are present on his robot head save two long ear-like protrusions that spring upwards from the side of his head. In many ways, Shockwave is Megatron’s opposite. He is cold and calculating. His utter lack of charisma makes him the most “robot-like” of all the Transformers. This is due to his belief that emotions are a source of weakness and distraction. As such, he strives to base his every decision on cold logic and hard facts. He leads through strength alone and does not care about his associates’ “buy-in.” He only desires their obedience. Yet, it is clear that Shockwave suffers from the same desires that drove Megatron to conquest. He is greedy and arrogant. These traits give him a tactical blindspot, which clever foes can use against him. All Powers (except Energy Blast) are Form Functions (+1FC). Energy Blast has No AV (-1FC). Self-Link (Gadgetry) is Always On and makes Shockwave a Robot (-1FC). Self-Link (Gadgetry) does not prevent him from healing (+1FC). Mind Probe has No Range (-1FC) and only works on other Cybertronians (-1FC). Self-Manipulation can only be used to assume the form of a Giant Space Gun with the following stats: Space Gun [BODY 12, Energy Blast: 16, Flight: 08, Growth: 06]. Immortal, Life Support (Breathing, Drinking, Eating, Sleeping), Miscellaneous (Cybertronian). Exile (Involuntary), SPR (One Hand), Strange Appearance. Writeup completed on the 6th of February, 2017.